On the 27th of July, Tikki took part in Etihad assessment day in Abu Dhabi. Unfortunately, Tikki did not pass her assessment day but she is kind enough to share her experience with you today and hopefully help you prepare better for your assessment day with Etihad Airways. 10:20-11:30 - Prompt speech (1 on 1 stage with assessor) 1 question only , no need to hesitate it was a random question. When was the last time for you to take all responsible for other's mistake? I could say that I recently have to take all responsible for my buddy since she's very new. If something goes wrong, I'm the only one who have to approach my senior,supervisor and my manager to explain what went wrong. Even it's mine or her mistakes. This stage was so quick 100 candidates within only 45-50 minutes. I finished in 1 minutes only. I'm so positive and I know how to make an interesting answer. The first 7th seconds need to be straight forward to the question. It shouldn't be longer than 1 minute as well. Note: They have taken the feedback from you in every single stage. Don't focus on the answer too much because if you do, you'll be so serious and you won't be able to listen to other candidates, don't forget to smile. You don't have to give them the right answer though it should be possible and reasonable. Smile and speak at the right time. It was so easy and the assessor didn't ask the group final decision individually. Required documents will be summited while you are waiting for the final interview. Be well prepared, I couldn't do well because I panicked a little. I didn't expect that it's gonna be on the same day. Cabin crew interview questions that I was asked! - What is the challenge of living in Abu Dhabi? - Tell me about the time when you provide the service as a part of the 5-star airline? - Can you please introduce one of your colleagues? What did you learn from her as you are the only one Thai hostess among of them? Golden email or regret email. I got a regret email and even though it was so quick and waiting doesn't kill me at all. Now I know what was my mistake and I'm gonna try again after 6 months. Fingers crossed and I wish you luck on your assessment day. Many thanks to Tikki for sharing her experience, If you want to share your assessment day experience, visit our facebook group and submit your experience and thoughts with future candidates. It was so quick! Be well prepared,final interview in Abu Dhabi always happens in the same day. I have a question and I've been trying for a time to get an answer; maybe someone here can help me with that. 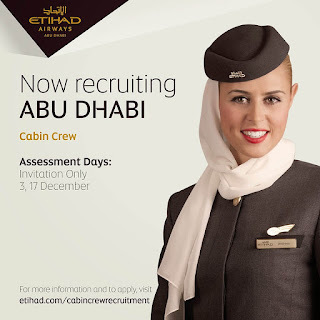 I worked for Etihad last year , only 6 months but unfortunately I had to resign due to some problems back home,but now I'm good and I really want to fly again..it was amazing.. do you think i still have the chance to rejoin Etihad (of course after attending an interview and so on )? I was invited to the assessment day but l m from Turkey and there is no assesment day nearer to my country. Can l attend to in Abu Dhabi assessment day? Do you know when is the assessment day Etihad airways?